Welcome to the tribe, all newcomers! Thank you for joining us and getting us to the stretch goal for the Altar! We are all blown away by the passion for this game. We unlocked this unbelievable stretch goal so fast we didn't have time to properly introduce them! This is a 7th tribe that players can select! The art is still being worked on, but this is the rough so far. Speaking of new tribes! The next stretch goal to reach is the 8th tribe, the Kia Kia! I have to admit, this might be my favorite of the artwork so far, and its still in rough! We are so excited to be listed in the Hotness list on the left side of the boardgamegeek site! We hope everyone has a great weekend! If you play games, let us know in the comments section or Facebook group what you played! What a weekend! Normally Kickstarter creeps along on the weekends, but you guys are not slowing down. We gained about $20,000 this weekend! Welcome to the tribe if you've just joined us. The cave drawings are complete! We now have badges to show off! Upload and set as your avatar the tribe you want to play first when you get your game! We'll see which tribe gets the most love in the Kickstarter Comments section. BGG Mystics of the tribe, we need your help! We're climbing the hotness track on the #1 board game website, and a couple of thumbs on our cover image and voting for your favorite tribe art will help us out. Click here to thumbs up the cover image! If you go to our Facebook Group, you'll see we posted 3 options for an arrowhead score marker that will replace the score markers in the game for both Standard and Deluxe editions! Tell us which one you would prefer! Brad Brooks, designer of Rise of Tribes, remarked that it really does take a village to make this all possible, so we thought we'd make some very special game goals to reward community growth. Below is a chart of social goals, ranging from backer count (get a friend!) to snapping fun photos. If we get 10 of these goals, we'll TAME THE MAMMOTH (event upgrade)! 12 goals and we'll introduce another first print exclusive hex tile, the TAR PITS! 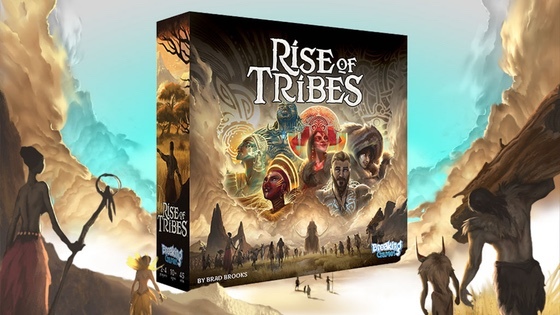 Finally, if our tribe can get to 15 points (just like the game), we'll introduce LEADER MEEPLES in every box of Rise of Tribes (both standard and Deluxe editions)! We're so excited to see how the tribe answers this war cry! Meeples, and Mammoths, and Lands Oh My! Welcome new tribe members! We just hit 250 subscribers on the boardgamegeek page! That's another social goal knocked out. We're getting closer to the Event upgrade that allows you to tame the Mammoth. I want to be the guy riding the mammoth on the cover of the box! We're very close to 750 members of our Facebook Group tribe! With everyone's input considered, the race was so close, we gave our designer, Brad Brooks, final call. The arrowhead score markers we just unlocked will be option B! The Great Lands are 3 new tiles that serve as an unique version of the common forest, lake and mountain tiles. They are now included in both Standard and Deluxe editions. Thank you for reaching this stretch goal! We have been eager to share this art (though it is not finalized). These lands stand out from the normal tiles, and would make very attractive resource holders. Place your stone, food and wood on these cards and keep them nearby the map. The great lands can be considered special versions of forest, lake and mountain, and as such they have been imbued with magical energy (thank you Sergio Chaves for gorgeous illustrations) that grants +1 to all resource gathering. Mix these in as one set of your terrain if you want them dotted throughout the map. Scenario play - 3 new tiles, which count as forest, lake and mountain, gives everyone tiles to play variants, possibly with more players or with quests or wherever your imagination takes you in Rise of Tribes. We unlocked this stretch goal a while back, but we wanted to make sure we had it right before showing. This is close, but may very slightly in the end. Now both Standard and Deluxe games will have 80 custom spear-wielding meeples!